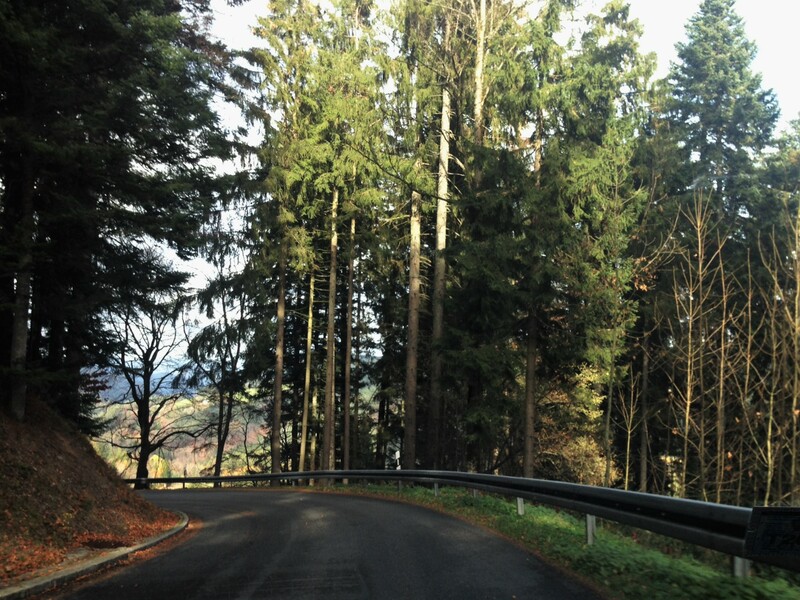 Triberg (Tree-burg) is under a two hours drive from Stuttgart into the Black Forest, or Schwarzwald in German. The quickest route is autobahn mostly until the last half hour where the road takes you uphill through towns and the towering forest. Driving back at night (5pm) is a different experience because it’s very dark. The winding roads in these areas, like much of Europe, are not lit. 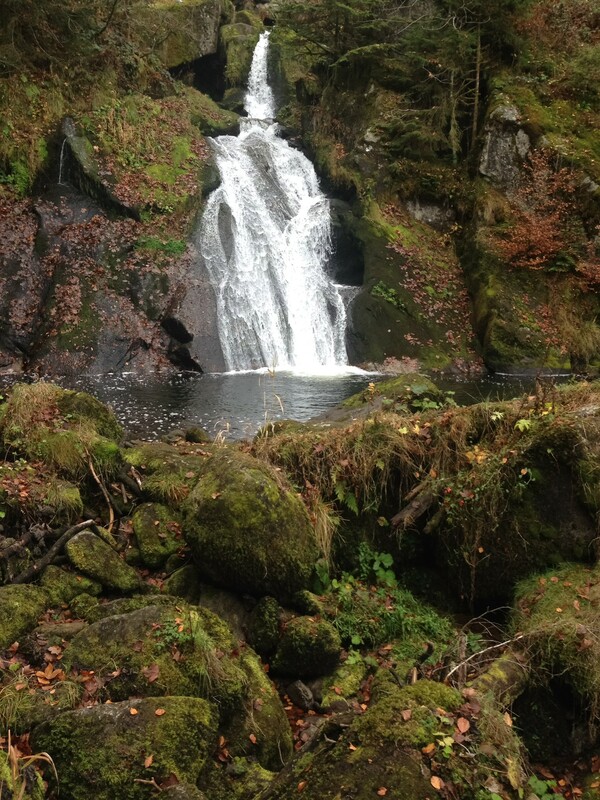 Hike the waterfall – it is the tallest waterfall from start to end in Germany. 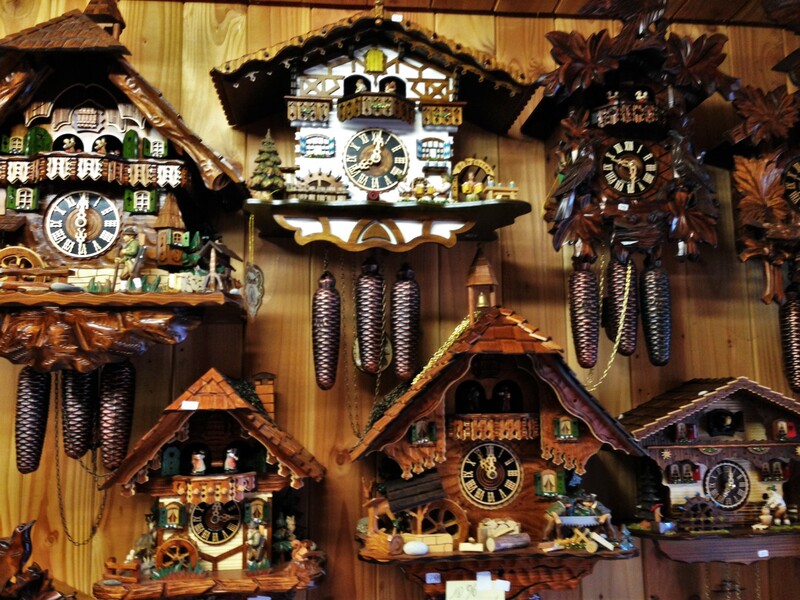 Get a hand carved German cuckoo clock – because when you live in Germany, you have to. 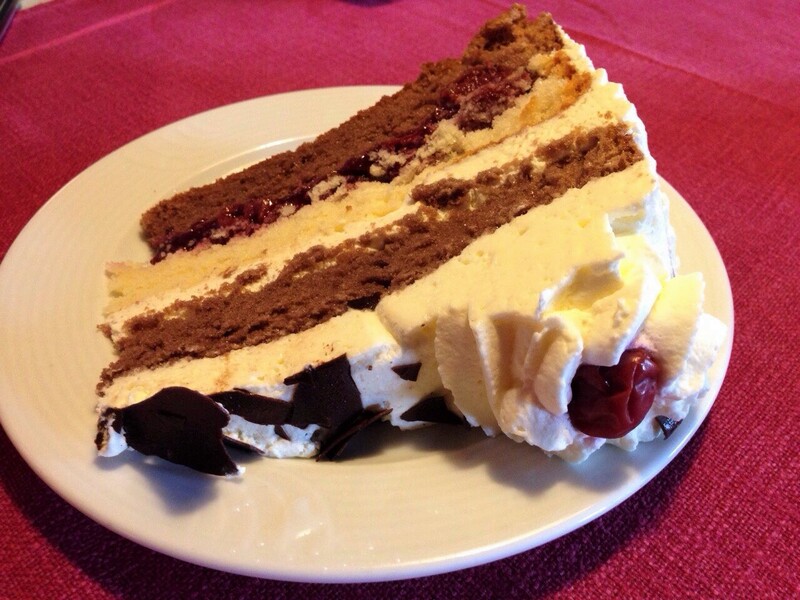 Eat hausgemachte (homemade) Black Forest Cake – in the Black Forest. Take a picture with the largest cuckoo clock in the world. We made it to 3.5 out of 4. Shorter daylight days in the winter here really impede on what you can complete in a day trip. It starts getting dark just after 4pm this time of year. We made it to the largest clock, but it was already dark so we will have to go back to see it for real. The good thing is, it is an easy trip and really pretty place to bring visitors, so be ready, whoever visits next is going here. There are several hiking trails both paved and unpaved. We parked for free by the Schwimmbad and started on the unpaved route. the uphill route to the top eventually turns into the paved route, but it is no less of a workout to the top – no switchbacks here, the path goes straight up the majority of the way. The way up it the prettiest part to stop for photos. The top ends at a parking lot and is not impressive at all surprisingly. The other expectation was that the fall doesn’t fall continuously. It is the tallest connected waterfall, but it falls and pools, then falls and pools again vs. one extremely tall running waterfall. The path down is the same but when you hit the bottom where the bridges are, you can branch off again to different trails. The trail toward the church loops around and lets you out at a pond, then the road leads right into town (just past where the buses park) where the restaurants and clock shops begin. We drastically underestimated how much time it would take us to look at all the clocks. It seemed there were only two shops that actually hand-carved the wood features for the clocks, so that made it a little easier to narrow down where we were going to buy. The rest were factory produced or cut wood, and had plastic parts which you don’t really notice too much until you see the real thing to compare. The real ones are so much nicer. Olis Schnitzstube is the place that eventually won after debating over lunch, and going back a second time. The craftsman there are a part of Master Carvers Club (MCC Clocks ). The shop that connects to it next door was also in the running, it was a truly hard decision. All take VAT tax forms and all spoke English among other languages. They also ship to German addresses free, and to the U.S. we overheard them quote someone about $35. The clocks are not cheap, adding to the difficult decision-making process, nothing under 150 euro that we saw. The good thing is, you can customize anything you want on the face of the clock and even the stain. We of course had some changes which the store had no problems with at all. There are two kinds of clock settings with cuckoo clocks we didn’t know about before. There are one day and eight-day clocks – meaning depending on the one you buy, you have to reset it every single day or every eight days for it to continue to work. We chose a one day clock but opted upgrade it to an eight-day function. We can barely remember to defrost something for dinner each day, there is no way we would remember to reset a clock. Even a weekly basis is stretching it, but we will give it a whirl. If nothing else, it will be pretty hanging on our wall and will remind us of Germany. As I mentioned earlier, we debated over clocks at lunch. There was a cute German restaurant near the shops we stopped in for lunch – and cake, called Wirtshaus Alt-Tryberg. It’s cuter in person than the pictures on Trip Advisor. The food was great for German food. Most importantly, their cake was homemade and delicious. Different, and lighter than what Americans think of a Black Forrest Cake. Theirs had cinnamon in it with light chocolate sponge cake and whipped cream layers with liquor soaked fresh cherries and dark chocolate shavings . Amazing. It did go along the guidelines for the traditional recipe: click here. View the photo album, click here. Great place– spent a snowy night there last January. Walked the falls, bought the clock (from Olli’s–you’re right, the local craftsmen are definitely the way to go, we love our clock), enjoyed every minute of it! Thanks for the post.